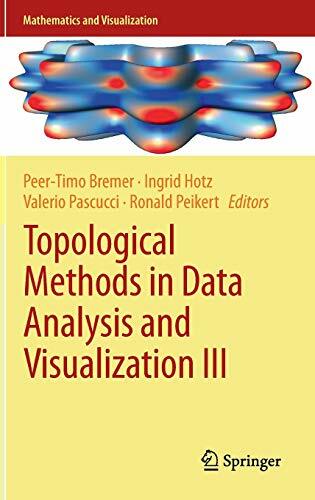 [PDF] Topological Methods in Data Analysis and Visualization III: Theory, Algorithms, and Applications | Free eBooks Download - EBOOKEE! Description: This collection of peer-reviewed conference papers provides comprehensive coverage of cutting-edge research in topological approaches to data analysis and visualization. It encompasses the full range of new algorithms and insights, including fast homology computation, comparative analysis of simplification techniques, and key applications in materials and medical science. The volume also features material on core research challenges such as the representation of large and complex datasets and integrating numerical methods with robust combinatorial algorithms. Reflecting the focus of the TopoInVis 2013 conference, the contributions evince the progress currently being made on finding experimental solutions to open problems in the sector. They provide an inclusive snapshot of state-of-the-art research that enables researchers to keep abreast of the latest developments and provides a foundation for future progress. With papers by some of the worldâ€™s leading experts in topological techniques, this volume is a major contribution to the literature in a field of growing importance with applications in disciplines that range from engineering to medicine. No comments for "[PDF] Topological Methods in Data Analysis and Visualization III: Theory, Algorithms, and Applications".